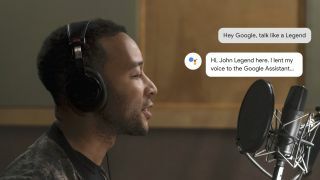 If you've ever dreamed that you would one day wake up to John Legend giving you the weather report, you could be in luck; Google has announced that John Legend's voice is now available "as a cameo on the Google Assistant for a limited time in the US". You can activate the special voice by asking your Google Home speaker questions like "are you John Legend?" and "what's your favorite type of music? ", or by asking Google Assistant to tell you a joke. Google says that other responses will "continue to be in one of the regular Assistant voices". As well as asking some of the aforementioned questions, you can also open up the Google Assistant Android or iOS app and change your Assistant voice settings to hear John Legend speak. Google has hinted that you may be in for a few surprises once you activate John Legend's voice, and suggests that you try saying "Hey Google, serenade me" or "Hey Google, are we just ordinary people?" A spokesperson for Google said in an email sent out to TechRadar and other press that "there are quite a few fun Easter Eggs out there", so it's probably worth exploring what your Google Home speaker can do. It doesn't matter which Google Assistant device you have; Google says that "John’s voice is available as a cameo on all devices that have the Google Assistant, including Google Home speakers and Smart Displays, and on mobile for Android and iOS". Google hasn't said whether other territories like the UK and Australia will be getting their own celebrity cameos for Google Assistant, saying that the John Legend cameo is only "available in English" for users in the US. The company also hasn't confirmed how long the feature will be available for, so if you want to try it out, it's worth doing soon. If the news of John Legend's voice cameo sounds familiar, that's because the feature was accidentally leaked after a bug caused the voice to go live in late March. Google Assistant isn't the only voice assistant to have been given a new voice. Earlier this year, Amazon rolled out a fresh new speaking style to Alexa users in the US, modeled on the way newscasters deliver the news. Alexa's 'newscaster voice' is designed to have clearer intonation and to emphasize words in a way that sounds less robotic than Alexa's default voice.